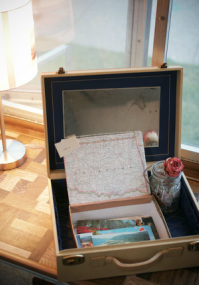 This interactive traveling trailer comprises edited found videos from internet sources archived in drawers, suitcases and books; photographs; maps; postcards; an interactive olfactory station; several audio stations containing road trip stories from members of the community; and much more. Information technology is changing the immediacy, availability, and archivability of information. This piece makes use of old home movies and current stories about road trips to address how future generations will interact with the past. 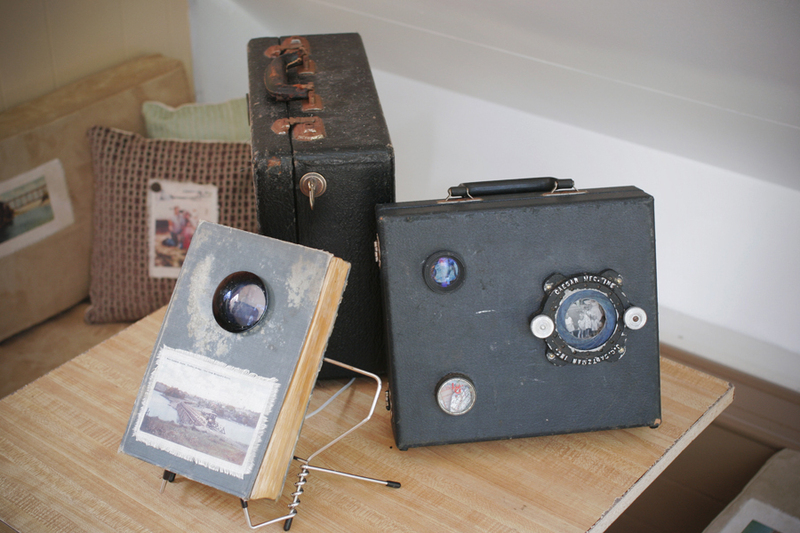 Participants can explore drawers and cabinets and find videos embedded in books; they can rummage through musty suitcases for postcards and photographs; and are invited to add their own travel stories to an audio archive that will play continuously for the duration of the show.To see a video click here. To view postcards click here. Shows: San Luis Obispo Museum of Art, Solo Exhibit: May - June 2013. ZER01 San Jose International Biennial: September 16th - 19th, 2010. SubZero Street Festival San Jose, CA: June 4th, 2010.